Last night’s dinner was a variation on fajitas. Instead of using organic ground beef, this preparation used buffalo. You may recall my past foray with buffalo burgers, an absolutely delicious meal. Ground buffalo was browned with a few spices (including crushed red pepper). 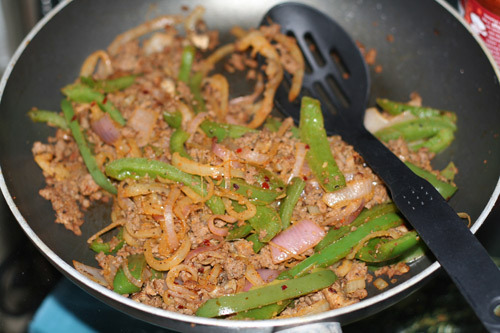 Thinly sliced green pepper, red onion, yellow onion, and mushroom were added so that it could all cook together.